Representatives of the Denman Island Volunteer Fire Department held their annual Community Pancake Breakfast at the Denman Firehall on Canada Day. Thanks to the efforts of 30 plus volunteer fire fighters, the three Denman doctors, and other helpers, this festival was great fun and a great success. 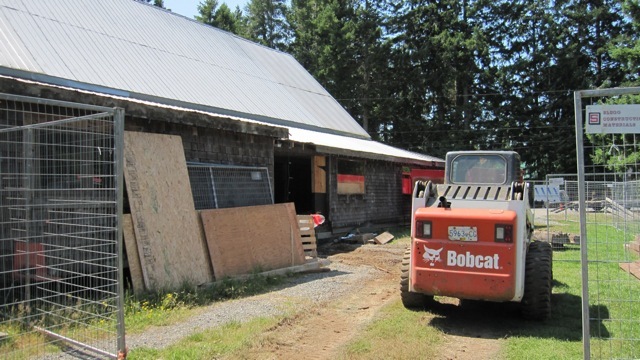 Proceeds of the event were donated to the Denman Island Recreation Commission Society (DIRCS), to assist with major renovations to the Denman Island Community Hall, in celebration of the Hall’s 100th birthday. 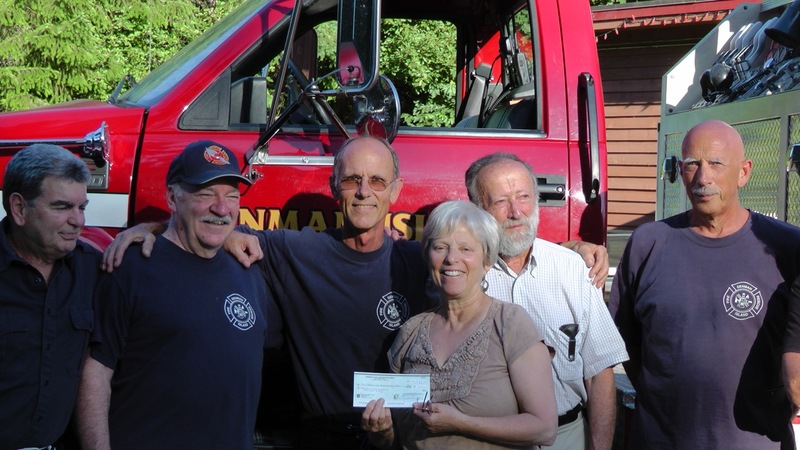 Boyd Mackean and Margie Gang of DIRCS received a sponsorship cheque for $5,165 from firefighters Peter Marshall, Don Luckett, Len Fortier, and Richard Green. They offer special thanks to Darryl McLoughlin of the Denman General Store for his generous support of their legacy project, which is also sponsored by the Canadian Building Communities Through Arts and Heritage fund, the Coast Sustainability Trust, the B.C. Heritage Legacy Fund, the Comox Valley Regional District, and the Comox Valley Foundation. The 80 plus community volunteers who’ve contributed hundreds of hours to this heritage restoration make it a true and inspiring community project. The earliest European settlers on Denman Island arrived in the 1870’s. These early pioneers were resourceful; faced with relative isolation on an island, they formed a cohesive community prepared to meet its needs through working together. This was Denman’s tradition; the ability to achieve a goal by taking initiative and working as a team. The Community Hall is a testimonial to that tradition. In 1912, members of the newly formed Athletic Club purchased shares to help fund the construction of this Community Hall with volunteer labour. Rehabilitation, restoration, and expansion work have been on-going throughout the hall’s history, much work done by volunteers. In it’s early days, the Community Hall was used for the school’s Christmas pageants, for meetings of the Boy Scouts, for political gatherings, and for the annual Fall Agricultural Fair. When electricity came to the island in 1957, Denman was added to the National Film Board’s monthly program of supplying films to rural communities. The novelty of having picture shows on Denman drew large crowds. The isolating nature of the homesteads in this rural agricultural community meant that these social gatherings were particularly important to for the solidarity of the community. Now, as in the past, the Community Hall serves as the heart of much of the Island’s political and cultural life. Descendants of some of the pioneer builders are still using the hall. 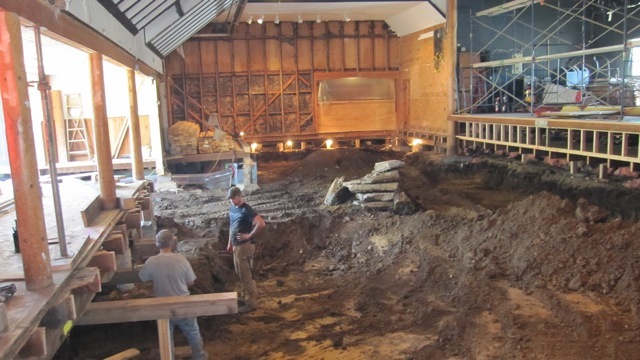 This summer, the hall will be undergoing significant foundation restoration. Funding from five outside sponsors has made this possible. We’re extremely grateful for contributions from the federal Building Communities Through Arts and Heritage fund, the Coast Sustainability Trust, the Heritage Legacy Fund, the Comox Valley Regional District, the Denman WORKS! Grant Facilitator, and the Comox Valley Foundation for making this possible. Community fundraising has also made, and continues to make, substantial contributions to the work. The fundraising aspect of the project began in late 2010. 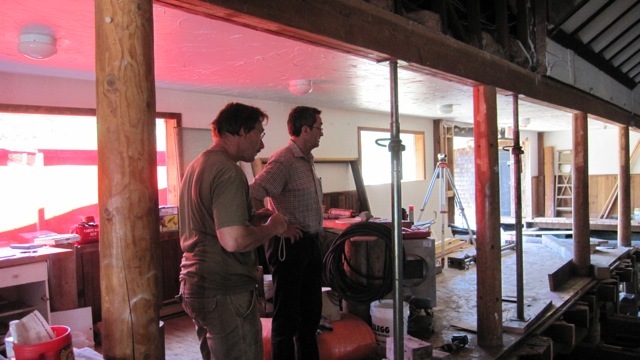 Once funding was in place, a detailed building plan was developed by a local engineering firm, following geotechnical study of the underlying soil. C & W Campbell, a commercial contractor with experience with heritage structures, was selected. After a year of planning, fundraising, paperwork, meetings, phone calls, emails, and budget planning, actual work on the ground has started. 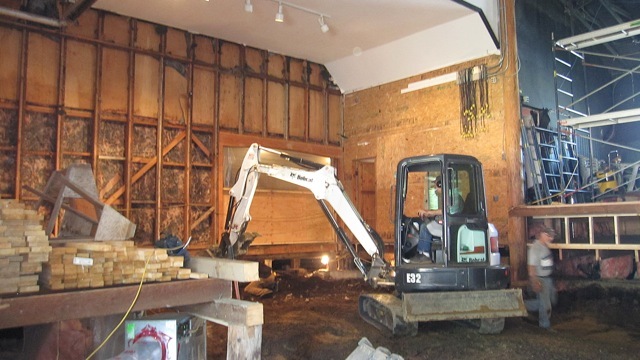 The rehabilitation will involve supporting the walls and roof of the main hall with plywood panels, then removing the floor, joists, and beams under this part of the building. A skim coat of concrete will be pumped in, and the foundation walls and piers will be replaced with ones consistent with current building standards. The joists and beams will be replaced with new construction. The floor will be replaced with a finished plywood one, but community fundraising may allow us to cover this with a hardwood one similar to the existing floor. When the project is complete, DIRCS will host a 100th birthday celebration in the hall. This will honor our heritage and culture as well as our sponsors. Last week, island volunteers began work on the construction phase of the project. During the week, the large human sculptural forms that guard the doorway to the back hall were taken down. Then on several subsequent days, the lighting, heating, and sound fixtures, electrical cords, and the stage curtains were removed – in fact, virtually everything that could be removed, was – and placed in storage. On Saturday, June 2, about 30 volunteers came to Hall Clean-up Day to help with this project. Interior paneling was stripped and either salvaged or burned, the apron of the stage removed, and much other equipment was stowed on the stage. (During the construction, the stage area will be walled off from the rest of the main hall.) In addition to this work, various parts of the hall were cleaned and windows were washed. Huge piles of library books were removed, and shelving taken down. Grass around the children’s playground was cut, and brush and weeds around and in the tennis court were removed. C & W Campbell’s anticipated start date is June 18th. All going well, the restoration work will take 3 to 4 months. During this time, the back hall, kitchen and preschool will still be operational (and closed off from the main hall by a plywood partition), but the main hall and a portion of the surrounding field will be off limits to anyone but their crew. Hiring procedures for interested local builders will be established shortly. Many thanks to: Arts Denman, Eric Atlee, Louise Bell, Des Bowman, Jean Coburn, Riane daSilva, Denman Hardware, Mike Dennis, Bill Engleson, Tim Fuchs, Andrew Fyson, Margie Gang, Denise Gratton. Jane Guest, Amy Harrington, Liam Harrington, Bev Hollingsworth, Bob Koontz, Mike Lindsay, Boyd MacKean, Sharon Mackin, Peter Marshall, George McFaul, Dale Merrick, Brian Miles, Kevin Mitchell, Jack Mounce, JayneAnn O’Rielly, Kathy Rieder, Ian Saunders, Judith Scruton, Roger Smith, Don Spence, Charlie Tait, Josh VanDale, Bob Vosberg, Terri Wenner, and Wendy Wright (and my apologies to any helpers I missed) for their contributions to this effort. It’s great to see this best of Denman traditions so alive.